My poor son Ryan. I started his room 2 years ago and I'm embarrassed to admit this, but I didn't finish it. Different commitments and projects took over leaving my son with a room painted blue on three walls with the fourth unpainted! While he doesn't mind - he hates change of any kind, I certainly do! Of course, I thrive on constant change. As I said as the beginning of this post, poor Ryan! The other day as I was putting away laundry I decided it was definitely time to finish his room. But how? So, I am trying to find some inspiration to show him so he will grant me a green light to decorate his space! I want the room to reflect his interests. Ryan likes geography and foreign places, he loves history -- especially WWI and WWII. Rye is also an avid soccer player, an honor roll student who excels at French, and also plays a bit of guitar. He loves boating, summers on Block Island, and is a Boy Scout. His favorite color? Blue. Here are a few ideas I've found while looking for inspiration to show him. A nautical theme might be nice and allow me to use up those buoys and oars hanging around in the basement as well as the sailboat prints I've had since before I met my husband! I love the Ralph Lauren madras plaid bedding below. I love this leather sleigh bed from Ralph Lauren, but the bedding would definitely be destroyed the first time Doritos made an appearance! Okay, so our family is crazy about maps, globes, and nautical charts! Minus the kiddy stuffed animals, the room above is great! Originally in a Pottery Barn catalogue, I love the map on the wall (above) I think it might be cool to paint a nautical chart of Block Island as a focal point on one wall. And, yes, I'm smitten with that rug! Below is a vintage poster of Block Island I found. I love the minimalist design in the room above, but practical me asks, what would I do with all Ryan's furniture? As cool as this room is too, I just don't see my traditional son loving it! 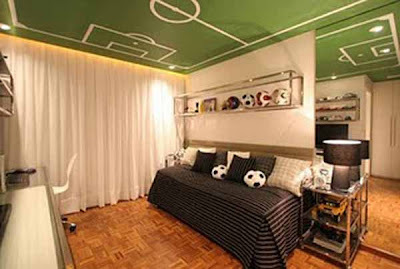 The inevitable favorite for a boys room is a sports theme: shown above, soccer. Below, tennis. However, Ryan isn't that obsessed! Does a teen room have to have a theme? I love this room in black & white and the way it mixes traditional and contemporary elements. Since Ryan's room is rather small this has the added bonus that it would make the space appear larger. Black & white sailing photos would be a nice touch too. 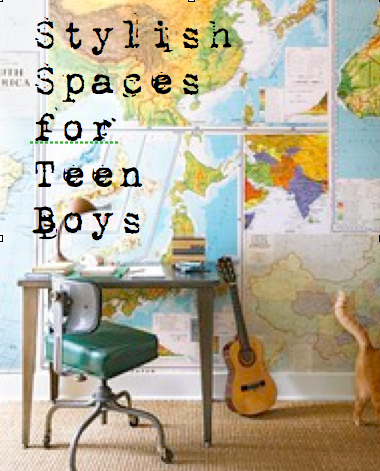 Doesn't a teen boy's room need a spark of bold color - like orange? While the room above has too much orange, I think it could be a hip accent color in a deep blue, brown, or charcoal gray room - like the one from decorpad. 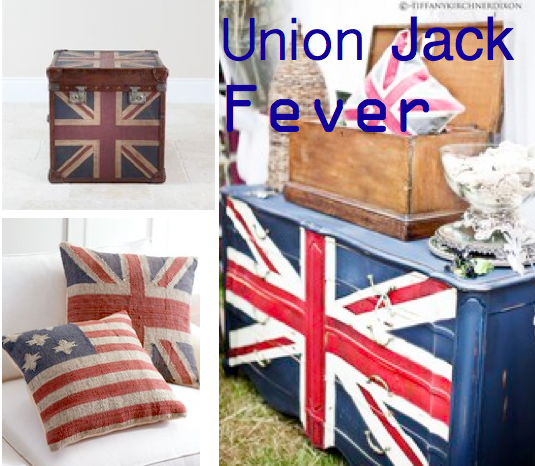 Knowing Rye, a toss pillow or, even a WWI poster or two might be enough to bring in the color. The traditional space above looks like something Rye would love as long as I got the posters and accessories right! I love both of these rooms! Especially the blue & white stripes on the duvet to the wood wall in each room, the graphic pattern carpet in the top photo, and the great wall art in the bottom one. It's important that Ryan have a place to study to keep those great grades! 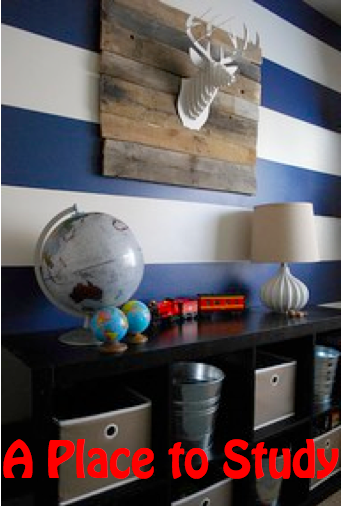 Love the wood palette backing to the paper "trophy" on the wall and the blue & white stripes! This design is so very cool & hip for a teen. There are tons of cool vintage posters available online as well to decorate the walls. Since Rye loves travel and studying the World Wars, I thought he might like one of these items to accessorize his space. Hope you found some inspiration.. and that Ryan likes some of these ideas too! By the way, did I mention my other son Jack's room needs to lose the safari theme from childhood now that he's 13? I have my work cut out for me I see!